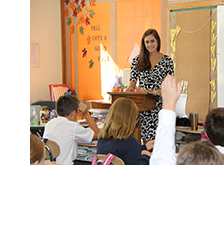 At St. James School, we have assembled a great team of highly qualified administrators, teachers, and support staff. In keeping with the philosophy of St. James School, we strive to challenge our students to move beyond textbook learning. We hope to instill a lifelong love of learning, academically and spiritually, within the hearts of the children. As an educational team, we work to motivate and inspire our students to do their personal best, preparing them for a future without limits. We recognize that parental involvement in a student’s education is critical to the success in achieving our goals. We welcome and encourage your input. Please do not hesitate to contact any member of our faculty or staff with questions or concerns; we are here to serve you. Deacon Rene N. Barbeau, Jr.